As a home/business owner myself I know first-hand the joys that come from both. I also know that with adequate and functional space running both can be made much easier. I have lived in the Northwest Panhandle for my entire life. I grew up in Crestview and have raised my family here. We are all active members of First Baptist Church of Crestview. I believe in southern hospitality and do my best to treat everyone I meet with respect. I have been in the construction industry since 2003. Prior to that, I worked at CHELCO as the Right-of-Way Agent for over fifteen years. I can promise you that I will be dedicated to your project as if it were my own. My goal is to create a positive atmosphere during the planning and construction process that will reflect in the quality of your home or business. By choosing me as your contractor, you will be doing just that, working with me personally. I will be the one that takes your phone calls, places the orders for the materials needed, as well as, running all other aspects of the job. You will be dealing directly with me, not an employee that works for the owner. I am looking forward to working with you and your family on the next phase in your lives. A house is not just a house. It is a place where families come together to celebrate, mourn, create new memories and welcome new lives into the world. It is a place to feel comfortable, as well as, safe. A house is a home. I hope that together, we can build a home that will hold special moments that last a lifetime. Alan Paul Construction, Inc. is proud of each home that is built. Whether the project is from the ground up or just a remodel, I will do everything in my power to help you make your dream come true. 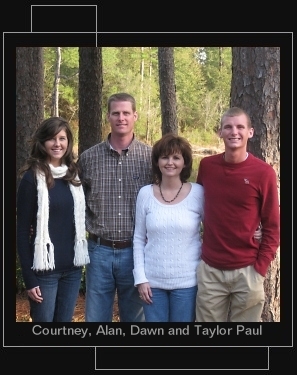 Taylor, Alan's son, works part-time at the construction company performing day-to-day office administration.